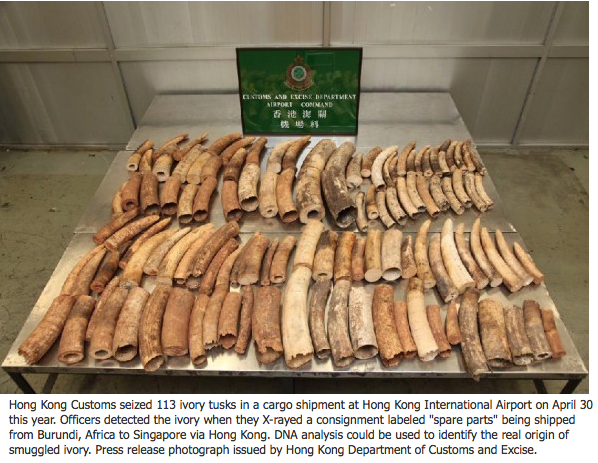 Hong Kong Customs seized 113 ivory tusks in a cargo shipment at Hong Kong International Airport on April 30 this year. Officers detected the ivory when they X-rayed a consignment labeled "spare parts" being shipped from Burundi, Africa to Singapore via Hong Kong. DNA analysis could be used to identify the real origin of smuggled ivory. Press release photograph issued by Hong Kong Department of Customs and Excise. With illegal ivory trade at its highest level in almost two decades, and large-scale ivory seizures more than doubling since 2009, a new commitment to submit ivory shipments for DNA testing is a welcome development. At the Convention on International Trade in Endangered Species (CITES) Conference of Parties meeting in March, countries agreed to submit samples from all future ivory seizures of more than 500 kilos (about 1,340 pounds), as well as those of that size from the past 24 months, to determine the origin of the smuggled ivory. The goal is to establish where the organized criminal networks responsible for these massive shipments are targeting elephants and then to focus law enforcement efforts on those poaching hot spots. The latest report of the Elephant Trade Information System (ETIS) noted that almost none of the 34 large-scale seizures made from 2009 through 2011 resulted in successful investigations of the criminals behind the transactions. Thus far, DNA from less than 5 percent of ivory seizures has been provided for analysis. “The single most important thing we can do is figure out where the killings are taking place,” says Samuel Wasser, Director of the Center for Conservation Biology at the University of Washington. Wasser and his team innovated techniques for extracting and analyzing DNA from ivory. The team also developed a DNA map for African elephants that allows the geographic origin of a tusk to be ascertained within a 160-mile radius. DNA analysis focused on origin has already produced interesting results. Testing of 6.5 tons of illegal elephant ivory seized in Singapore in 2002, 3.9 tons confiscated in Hong Kong in 2006, and another 11 tons confiscated in Hong Kong, Taiwan, and Japan (also in 2006) determined that the massive consignments came from closely related elephants in specific localities: eastern Zambia for the Singapore seizure, a small section of eastern Gabon and neighboring Congo for the single Hong Kong seizure, and southern Tanzania/northern Mozambique for all samples in the 11-ton seizure. Those findings proved that organized gangs were filling purchase orders by targeting whole herds in certain areas rather than by collecting ivory from disparate sources, as was previously thought. Many agents involved in wildlife law enforcement suspect that there are a finite number of poaching hot spots, which makes targeting those areas more feasible. Anti-poaching units could patrol specific locations, and wildlife law enforcement agents could monitor well-worn smuggling routes—ensuring the biggest bang for the limited bucks. Forensic analysis also has the power to link suspects to specific crimes. In addition to providing information on where a tusk came from, DNA analysis can be used to identify individual elephants killed in a particular incident. When a mass killing occurs, tissue samples from carcasses can be analyzed, so that when and if the tusks enter the illegal market, they can be matched to that same incident. Or a different one. Such was the case recently when 22 elephants (18 adults and 4 calves) were killed in Garamba, Democratic Republic of Congo (DRC). A short time later 36 tusks were confiscated. DNA analysis showed that the tusks did not come from those 22 elephants but from other elephants in the same overall population. DNA analysis could also be used to show domestic ivory markets are operating legally. Recently, Chinese officials have disputed allegations of large-scale importation of illegal ivory and insisted that there is no linkage between their legal imports and the massive elephant poaching presently taking place. One way they could prove their point would be to provide random samples of ivory from China’s legal markets for DNA analysis. If that analysis showed that it is all from Botswana, Zimbabwe, South Africa, and Namibia, where one-off sales were allowed, such allegations could be rejected. But if the DNA analyses pointed to origins elsewhere, such as the Democratic Republic of Congo, Chad, Tanzania, or Kenya, there would be clear grounds for rejecting the Chinese claims. In the coming months, compliance with the CITES agreement to submit ivory samples should be closely watched. While some countries might assert that financial constraints prevent them from sending in DNA samples, the truth of that claim is suspect because the analysis itself will be funded by outside sources. And the cost of shipping samples is minimal. Each sample is about the size of a one-inch coin, and only one tusk per pair needs to be tested. So a six-ton seizure would require shipping samples weighing less than a pound in all. If a country opts not to submit samples, one might wonder whether it is doing everything it can to stop elephant poaching and ivory trafficking. And it might cause one to wonder if the government was allowing seized ivory to find its way into the illegal trade. In contrast, a willingness to supply samples from seized ivory will help demonstrate a country’s commitment to stopping the illegal ivory trade. Hong Kong officials intercepted a container from Kenya holding 779 pieces of ivory tusk weighing 1.3 metric tons. Kenyan officials confiscated 2 metric tons of ivory (600 pieces) labeled “decorating stones” and bound for Indonesia from Tanzania. Malaysian officials confiscated two cargo containers from Togo headed to China and labeled as “wooden floor tiles.” Instead they held 2,341 pieces of tusks weighing 6,034 kilograms. Dubai officials uncovered a shipment of 215 pieces of ivory hidden in 40 boxes containing beans. Hong Kong officials intercepted a container from Tanzania with 972 pieces of raw ivory tusks (1.9 metric tons), along with ivory ornaments inside 91 bags of plastics scraps. Tanzania authorities arrested three men with 214 elephant tusks, secreted in several fertilizer bags.